Comment	 Residing on the constellation of Crux (Southern Cross) are the nebulae RCW68 and RCW69. 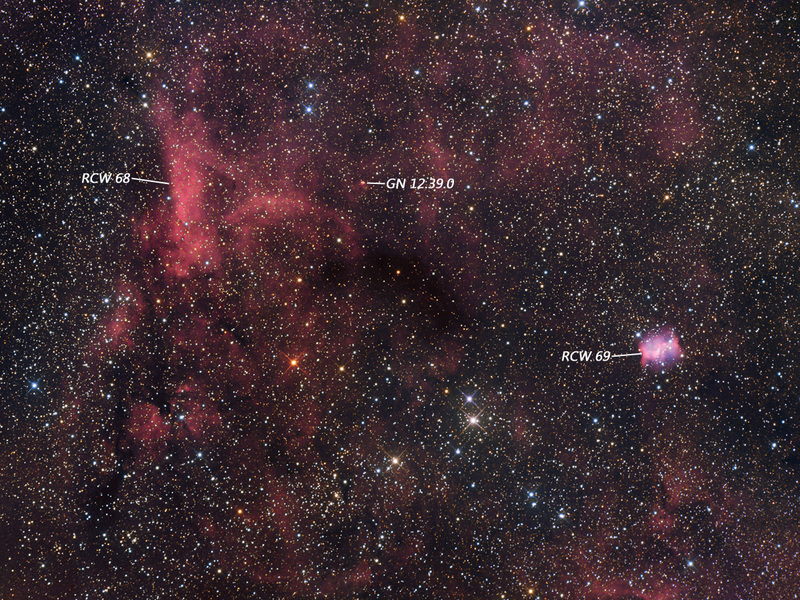 RCW68 is an faint emission nebula ionised by the O8 III giant HD 109978 and the B0.5 III giant HD 110498. The nebula lies towards the edge of the Cen OB1 association. RCW 68 is the brightest part of a large emission ring about 1 degree in diameter. The true nature and full extent of this nebula is much better revealed in infrared compared to visible wavelengths. Although once believed to be an HII region, RCW 69 is now established as a bipolar planetary nebula PN G302.1+00.3. It is one of the largest and nearest bipolar Type I planetary nebula discovered and displays both Ha (red) and OIII (blue) emissions resulting in a pink hue. The image is a [Ha+R]GB, OIII composite.